"HOV" and "HOV Lane" redirect here. For the song by Nicki Minaj, see Pink Friday: Roman Reloaded. For other uses, see HOV (disambiguation). A high-occupancy vehicle lane on Interstate 5 in Seattle, Washington, United States. A high-occupancy vehicle lane (also known as an HOV lane, carpool lane, diamond lane, 2+ lane, and transit lane or T2 or T3 lanes) is a restricted traffic lane reserved for the exclusive use of vehicles with a driver and one or more passengers, including carpools, vanpools, and transit buses. These restrictions may be only imposed during at peak travel times or may apply at all times. The normal minimum occupancy level is 2 or 3 occupants. Many jurisdictions exempt other vehicles, including motorcycles, charter buses, emergency and law enforcement vehicles, low-emission and other green vehicles, and/or single-occupancy vehicles paying a toll. HOV lanes are normally created to increase average vehicle occupancy and persons traveling with the goal of reducing traffic congestion and air pollution, although their effectiveness is questionable. Regional and corporate-sponsored vanpools, carpools, and rideshare communities give commuters a way to increase occupancy. For places without such services, online rideshare communities can serve a similar purpose. Slugging lines are common in some places, where solo drivers pick up a passenger to share the ride and allow them to use the HOV lane. High-occupancy toll lanes (HOT lanes), which allow solo driver vehicles to use HOV lanes on payment of a fee which varies depending on demand, have also been introduced in the United States and Canada. 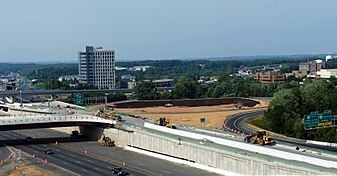 The first freeway HOV facility opened in 1969 in the Shirley Highway in Northern Virginia. As of 2012 the I-95/I-395 HOV facility operates as a two-lane barrier-separated reversible HOV 3+ facility (center lanes) with access through elevated on- and off-ramps. The introduction of HOV lanes in the United States progressed slowly during the 1970s and early 1980s. Major growth occurred from the mid-1980s to the late 1990s. The first freeway HOV lane in the United States was implemented in the Henry G. Shirley Memorial Highway in Northern Virginia, between Washington, DC, and the Capital Beltway, and was opened in 1969 as a bus-only lane. The busway was opened in December 1973 to carpools with four or more occupants, becoming the first instance in which buses and carpools officially shared a HOV lane over a considerable distance. In 2005, the two lanes of this HOV 3+ facility carried during the morning peak hour (6:30 am to 9:30 am) a total of 31,700 people in 8,600 vehicles (3.7 persons/veh), while the three or four general-purpose lanes carried 23,500 people in 21,300 vehicles (1.1 persons/veh). Average travel time in the HOV facility was 29 minutes, and 64 minutes in the general traffic lanes. As of 2012, the I-95/I-395 HOV facility is 30 mi (48 km) long and extends from Washington, D.C., to Dumfries, Virginia, and has two reversible lanes separated from the regular lanes by barriers, with access through elevated on- and off-ramps. Three or more people in a vehicle (HOV 3+) are required to travel on the facility during rush hours on weekdays. The second freeway HOV facility was the contraflow bus lane on the Lincoln Tunnel Approach and Helix in Hudson County, New Jersey, opened in 1970. According to the Federal Highway Administration (FHWA), the Lincoln Tunnel XBL is the country's HOV facility with the highest number of peak hour persons among HOV facilities with utilization data available, with 23,500 persons in the morning peak, and 62,000 passengers during the four-hour morning peak. The first permanent HOV facility in California was the bypass lane at the San Francisco–Oakland Bay Bridge toll plaza, opened to the public in April 1970. The El Monte Busway (I-10 / San Bernardino Freeway) in Los Angeles was initially only available for buses when it opened in 1973. Three-person carpools were allowed to use the bus lane for three months in 1974 due to a strike by bus operators, and then permanently at a 3+ HOV from 1976. It is one of the most efficient HOV facilities in North America and is currently being converted into a high-occupancy toll lane operation to allow low-occupancy vehicles to bid for excess capacity on the lane in the Metro ExpressLanes project. Beginning in the 1970s, the Urban Mass Transit Administration recognized the advantages of exclusive bus lanes and encouraged their funding. In the 1970s the FHWA began to allow state highway agencies to spend federal funds on HOV lanes. As a result of the 1973 Arab Oil Embargo, interest in ridesharing picked up, and states began experimenting with HOV lanes. In order to reduce crude oil consumption, the 1974 Emergency Highway Energy Conservation Act mandated maximum speed limits of 55 mph (89 km/h) on public highways and became the first instance when the U.S. federal government provided funding for ridesharing and states were allowed to spend their highway funds on rideshare demonstration projects. The 1978 Surface Transportation Assistance Act made funding for rideshare initiatives permanent. Also during the early 1970s, ridesharing was recommended for the first time as a tool to mitigate air quality problems. The 1970 Clean Air Act Amendments established the National Ambient Air Quality Standards and gave the Environmental Protection Agency (EPA) substantial authority to regulate air quality attainment. A final control plan for the Los Angeles Basin was issued in 1973, and one of its main provisions was a two-phase conversion of 184 mi (296 km) of freeway and arterial roadway lanes to bus/carpool lanes and the development of a regional computerized carpool matching system. However, it took until 1985 before any HOV project was constructed in Los Angeles County, and by 1993 there were only 58 mi (93 km) of HOV lanes countywide. A significant policy shift took place in October 1990, when a memorandum from the FHWA administrator stated that "FHWA strongly supports the objective of HOV preferential facilities and encourages the proper application of HOV technology." Regional administrators were directed to promote HOV lanes and related facilities. Also in the early 1990s, two laws reinforced the U.S. commitment to HOV lane construction. The Clean Air Act Amendments of 1990 included HOV lanes as one of the transportation control measures that could be included in state implementation plans to attain federal air quality standards. The 1990 amendments also deny the administrator of the EPA the authority to block FHWA from funding 24-hour HOV lanes as part of the sanctions for a state's failure to comply with the Clean Air Act, if the secretary of transportation wishes to approve the FHWA funds. On the other hand, the Intermodal Surface Transportation Efficiency Act (ISTEA) of 1991 encouraged the construction of HOV lanes, which were made eligible for Congestion Mitigation and Air Quality (CMAQ) funds in regions not attaining federal air quality standards. CMAQ funds may be spent on new HOV lane construction, even if the HOV designation holds only at peak travel times or in the peak direction. ISTEA also provided that under the Interstate Maintenance Program, only HOV projects would receive the 90% federal matching ratio formerly available for the addition of general purpose lanes. And ISTEA permitted state authorities to define a high occupancy vehicle as having a minimum of two occupants (HOV 2+). As of 2009, California was the state with the most HOV facilities in the country, with 88, followed by Minnesota with 83 facilities, Washington with 41, Texas with 35, and Virginia with 21. The only active U.S. facility with two HOV lanes in each direction is I-110 between Adams Boulevard and SR 91 in Los Angeles. By 2006, HOV lanes in California were operating at two-thirds of their capacity, and these HOV facilities carried on average 2,518 persons per hour during peak hours, substantially more people than the congested general-traffic lanes. The I-495 Capital Beltway in the Washington D.C. Metropolitan Area. The facility is located in the median, has two HOV lanes in each direction with elevated on/off ramp access, and a total of 224.0 mi (360.5 km) of lanes. As of October 2016, the longest continuous HOV facility in the U.S. is on I-15 in Utah, extending approximately 72.0 mi (115.9 km) from Spanish Fork to Layton with a single HOV lane each direction for a total of 144.0 mi (231.7 km) of HOV lanes. While the Utah facility is the longest, the I-495 Capital Beltway in the Washington, D.C., Metropolitan Area extends 56.0 mi (90.1 km) but has two HOV lanes in each direction for a total of 224.0 mi (360.5 km) of HOV lanes. As of 2012, there are some 126 HOV facilities on freeways in 27 metropolitan areas in the United States, which includes over 1,000 corridor miles (1,600 km). The HOV lanes in Ontario Highway 404 in Southern Ontario are separated by a striped buffer zone that breaks occasionally to allow vehicles to enter and exit the HOV lane. The first HOV facilities in Canada were opened in Greater Vancouver and Toronto in the early 1990s, followed shortly by facilities in Ottawa, Gatineau, Montreal, and later Calgary. As of 2010 there were about 150 km (93 mi) of highway HOV lanes in 11 locations in British Columbia, Ontario, and Quebec, and over 130 km (81 mi) of arterial HOV lanes in 24 locations in Greater Vancouver, Calgary, Toronto, Ottawa, and Gatineau. The Ontario Ministry of Transportation (MTO) estimated in 2006 that commuters in Toronto using the HOV facilities on Highways 403 and 404 were saving 14–17 minutes per trip compared to their travel time before the HOV lanes opened. 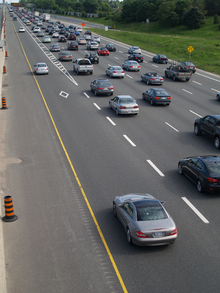 The MTO also estimated that almost 40% of commuters were carpooling on Highway 403 eastbound in the morning peak hour, compared to 14% in 2003, and 37% of commuters were carpooling on Highway 403 westbound in the afternoon peak hour, compared to 22% in 2003. The average rush hour speed on the HOV lanes is 100 km/h (62 mph), compared to 60 km/h (37 mph) in general-traffic lanes on Highway 403. Temporary HOV lanes were added to selections of 400-series highways in the Greater Toronto Area for the 2015 Pan American Games and 2015 Parapan American Games. As of 2012, there are a few HOV lanes in operation in Europe. The main reason for this is that, in general, European cities have better public transport services and fewer high-capacity multi-lane urban motorways than do the U.S. and Canada. However, at around 1.3 persons per vehicle, average car occupancy is relatively low in most European cities. The emphasis in Europe has been on providing bus lanes and on-street bus priority measures. The first HOV lane in Europe was opened in the Netherlands in October 1993 and operated until August 1994. Its facility was a 7 km (4.3 mi) barrier-separated HOV 3+ on the A1 near Amsterdam. The facility did not attract enough users to overcome public criticism and was converted to a reversible lane open to general traffic after the judge in a legal test case ruled that Dutch traffic law lacked the concept of a car pool and thus that the principle of equality was violated. Spain was the next European country to introduce HOV lanes, when median reversible HOV lanes were opened in Madrid's N-VI National Highway in 1995. This facility is Europe's oldest HOV facility that is still in operation. The first HOV facility in the United Kingdom opened in Leeds in 1998. The facility was implemented on A647 road near Leeds as an experimental scheme, but it became permanent. The HOV facility is 1.5 km (0.93 mi) long and operates as a HOV 2+ facility. A 2.8 km (1.7 mi) HOV 3+ facility opened in Linz, Austria, in 1999. Sweden opened its first HOV lane in Stockholm in 2000, an 8 km (5.0 mi) HOV 3+ facility. The first HOV lane in Norway was implemented in May 2001 as an HOV 3+ on Elgeseter Street, an undivided four-lane arterial road in Trondheim. This facility was followed by HOV lanes in Oslo and Kristiansand. The first HOV lane (known as a Transit Lane T2 or T3) in Australia opened in February 1992, located on the Eastern Freeway in Melbourne travelling inbound. In May 2005, T2 Transit lanes were opened on Hoddle Street in Melbourne. As of 2012, there were also T2 and T3 facilities in Canberra, Sydney and Brisbane. In Auckland, New Zealand, there are several short HOV 2+ and 3+ lanes throughout the region, commonly known as T2 and T3 lanes. There is a T2 transit lane in Tamaki Drive, in a short stretch between Glendowie and downtown Auckland. There are also T2 priority lanes on Auckland's Northern, Southern, Northwestern, and Southwestern Motorways. These priority lanes are left-side on-ramp lanes heading towards the motorway, where vehicles with two or more people can bypass the ramp meter signal. Priority lanes can also be used by trucks, buses, and motorcycles, and the priority lanes can be used by carpoolers at any time. Eleven lanes were opened to electric vehicles in a one-year trial from September 2017. There are also several short T2 and T3 facilities in North Shore City operating during rush hours. In Jakarta, HOV 3+ is known as "Three in One" (Tiga dalam satu) and was first implemented by governor Sutiyoso. HOV 3+ is implemented on weekdays in existing roads of Sisingamangraja Road (fast and slow lane), Jenderal Sudirman Road (fast and slow lane), MH. Thamrin Road (fast and slow lane), Medan Merdeka Barat Road, Majapahit Road, and sections of Jalan Jenderal Gatot Subroto. The policy was originally implemented only between 7:00 am and 10:00 am. Since the introduction of Jakarta's bus rapid transit in December 2003, the policy was extended to 7:00 am – 10:00 am and 4:00 pm – 7:00 pm. In September 2004, the evening time was changed to 4:30 pm – 7:00 pm. In Shenzhen, HOV 2+ has been implemented on Binhai Avenue since 25 April 2016. The policy was then extended to 7:30 am – 9:30 am and 5:30 pm – 9:30 pm. In Chengdu, from January 23, 2017, HOV 2+ has been implemented on Kehua Road South, Kehua Road Middle, and Tianfu Avenue Section 1 and 2, during 7:00 am-9: 00 am and 5:00 pm-7: 00 pm. In Dalian, an expressway (Northeast Expressway, or Dongbei Expressway) linking old town and new town had one lane in both outbound and inbound directions set to HOV 2+. Starting from September 20, 2017, commuters can opt to drive in HOV lane on Northeast Expressway during the morning peak hours of 06:30-08:30, and evening peak hours of 16:30-19:00. A fine of CNY100 (about USD15) will be enforced for first violators. For a second violation, the fine will double. A "semi-HOV" lane on I-24 in Nashville, Tennessee. These lanes function as HOV lanes only on weekdays during rush hour, and as regular lanes the rest of the time. HOV lanes may be either a single traffic lane within the main roadway with distinctive markings or a separate roadway with one or more traffic lanes either parallel to the general lanes or grade-separated, above or below the general lanes. For example, Interstate 110 in California has four HOV lanes on an upper deck. HOV bypass lanes to allow carpool traffic to bypass areas of regular congestion in many places and an HOV lane may operate as a reversible lane, working in the direction of the dominant traffic flow in both the morning and the afternoon. All lanes of a 10 miles (16 km) section of the Interstate 66 in the suburbs of Washington, D.C., are treated as an HOV during the rush hour in the primary direction of flow. The traffic speed differential between HOV and general-purpose lanes creates a potentially dangerous situation if the HOV lanes are not separated by a barrier. A Texas Transportation Institute study found that HOV lanes lacking barrier separations caused a 50% increase in injury crashes. A business access and transit (BAT) lane is a type of HOV lane that allows for all traffic to enter the lane for a short distance in order to access other streets and business entrances. Because some HOV lanes were not utilized to their full capacity, users of low- or single-occupancy vehicles may be permitted to use an HOV lane if they pay a toll. This scheme is known as high-occupancy toll lane (or HOT lanes), and it has been introduced mainly in the United States. The first practical implementation was California's formerly private toll 91 Express Lanes, in Orange County, California, in 1995, followed in 1996 by Interstate 15 north of San Diego. According to the Texas A&M Transportation Institute, by 2012 there were 294 corridor-miles of HOT/Express lanes and 163 corridor-miles of HOT/Express lanes under construction in the United States. Solo drivers are permitted to use the HOV lanes upon payment of a fee that varies based on demand. Tolls change throughout the day according to real-time traffic conditions, which is intended to manage the number of cars in the lanes to maintain good journey times. Proponents claim that all motorists benefit from HOT lanes, even those who choose not to use them. This argument applies only to projects that increase the total number of lanes. Proponents also claim that HOT lanes provide an incentive to use transit and ridesharing. There has been controversy over this concept, and HOT schemes have been called "Lexus" lanes, as critics see this new pricing scheme as a perk for the rich. HOT tolls are collected by manned toll booths, automatic number plate recognition, or electronic toll collection systems. Some systems use RFID transmitters to monitor entry and exiting of the lane and charge drivers depending on demand. Typically, tolls increase as traffic density and congestion within the tolled lanes increase, a policy known as congestion pricing. The goal of this pricing scheme is to minimize traffic congestion within the lanes. Motorcycles - motorcycles are allowed via federal United States HOV lane law (Title 23, Section 166). They cannot use HOV lanes in Ontario unless they have 2 passengers. New York City HOV lane codes prior to 2008 did not allow motorcycles leading to ticketing of motorcycle drivers and complaints from the American Motorcyclist Association, but have since been revised to comply with the federal regulations listed above. In some jurisdictions such as Ontario, Canada, taxicabs and airport limousines are allowed to use HOV lanes even when no passenger is present because that vehicle "will be able return to duty faster after dropping off a fare or arrive sooner to pick up a fare, thereby moving more people to their destinations in fewer vehicles". In Virginia, commuters form sluglines where drivers pick up one or more passengers from a designated "slug lines" to drive on HOV lanes along interstate 95/395; the driver pulls over near the sluglines and shouts out his or her destination, and people in the line going to that destination enter the car on a first-come, first-served basis. Dedicated reversible HOV lanes on Interstate 279 outside Pittsburgh. Fines are usually imposed on drivers of non-qualifying vehicles who use the lanes. Following the introduction the HOVs, some drivers placed inflatable dolls in the passenger seat, a practice that persists today, even though it is now illegal. Cameras that can distinguish between humans and mannequins or dolls were tested in the United Kingdom in 2005. Strapping dogs, cats, or other pets into the passenger seat. In March 2015, a motorist tried to use a cardboard cutout of actor Jonathan Goldsmith to access an HOV lane in Fife, Washington. The officer noted that other drivers had used sleeping bags in earlier attempts to access the HOV lane. In January 2013, a motorist tried to claim that the Articles of Incorporation of his business, which had been placed unbuckled on the passenger’s seat, constituted a person, citing the principle of corporate personhood and California's state Vehicle Code, which defines a person as "natural persons and corporations". This argument was rejected in traffic court, where the presiding judge commented, "Common sense says carrying a sheaf of papers in the front seat does not relieve traffic congestion." In February 2010, a 61-year-old woman tried to pass off a life-sized mannequin as a passenger in order to use the HOV lane in New York State. A police officer on a routine HOV patrol became suspicious when he noticed that the so-called passenger was wearing sunglasses and using the visor on a cloudy morning. When the officer approached the vehicle, he discovered that the "passenger" was, in fact, a mannequin wearing lipstick, designer shades, a full-length wig, and a blue sweater. The driver was issued a traffic ticket for using the HOV lane without a human passenger, which carries a fine of $135 and two points on a driver's license. In early 2006, an Arizona woman asserted that she had been improperly ticketed for using the HOV lane because the unborn child she was carrying in her womb justified her use of the lane, while noting that Arizona traffic laws do not define what constitutes a person. However, a judge subsequently ruled that to qualify as an "individual" under Arizona traffic laws, the individual must occupy a "separate and distinct" space in a vehicle. Likewise, in California, in order to use HOV lanes, there must be two (or, if posted, three) separate individuals occupying seats in a vehicle, and an unborn child does not count towards this requirement. In 2009 and 2010 it was found that non-compliance rates on HOV lanes in Brisbane, Australia, were approaching 90%. Enhanced enforcement led to increased compliance, average bus journey times dropped by up to 19%, and total person throughput increased by 12%. In 2006 it was claimed that many vehicles had only one occupant. According to 2009 data from the U.S. census, 76% drive to work alone and only 10% rideshare; for suburban commuters working in a city, the solo driving rate is 82%. Some underused HOV lanes in several states have been converted to high-occupancy toll lanes (HOT), which offer solo drivers access to HOV lanes after paying a toll. HOV lanes are also an effective way to manage traffic after natural disasters, as seen in New York City after Hurricane Sandy in October 2012. At the time Mayor Bloomberg banned passenger cars with fewer than three occupants from entering Manhattan. The restriction affected all bridges and tunnels entering the city except the George Washington Bridge. Critics have argued that HOV lanes are underused. It is unclear whether HOV lanes are sufficiently used to compensate for delays in the other mixed-use lanes. Las Vegas, Nevada has been considered a city where its HOV lanes on US-95 are considered useless and underused due to it being far from a "nine-to-five" city, but were built because federal funding was earmarked for the project. Further criticism was made during the 2009 recession in the building of the HOV flyover exit to and from Summerlin Parkway, a freeway that still lacks HOV lanes. The situations have caused social problems in Indonesia, where some people become "car jockey", people who make their living by offering drivers to fill their car in order to meet the occupancy limit. Reportedly the situation caused people stay in unemployment for doing so, increased congestion and let parents profit from their babies. In 1995, six people died in a head-on collision when the gates of a reversible lane were not set correctly on the Interstate 279 in Pittsburgh, Pennsylvania. California HOV sticker for hybrid electric vehicles (the benefit expired on 1 July 2011). Nissan Leaf electric car with Maryland's sticker to identify plug-in electric vehicles eligible to use HOV lanes with solo drivers. California's green Clean Air Vehicle sticker to allow solo access for plug-in hybrids to HOV lanes. A T3 HOV/bus lane on route 116, in Lévis, Quebec. ^ a b c d "High Occupancy Vehicle Lanes in Canada – Overview". Transport Canada. 2010-08-26. Archived from the original on 2012-04-19. ^ Federal Highway Administration (2009-07-27). "A Review of HOV Lane Performance and Policy Options in the United States – Section 1: Introduction". FHWA Tolling and Pricing Program. Retrieved 2012-04-25. ^ "Transit Lanes". Roads and Traffic Authority, NSW. Retrieved 2012-04-25. Budapest 29–31 October 2003. ^ Sharon Shewmake (November 2012). "Can Carpooling Clear the Road and Clean the Air? Evidence on the Impact of HOV Lanes on VMT and air pollution". Journal of Planning Literature. ^ a b c Katherine F. Turnbull. "History of HOV Facilities". Federal Highway Administration (FHWA). Retrieved 2012-04-26. Complete account published in Katherine F. Turnbull (1992), "HOV Project Case Studies: History and Institutional Arrangements"
^ a b c d Federal Highway Administration (December 2008). "Section 2: Operational Description of the Nation's HOV Lanes". FHWA Tolling and Pricing Program. Retrieved 2012-04-24. ^ a b California Department of Transportation (Caltrans) (2007). "Managed Lane". Caltrans. Retrieved 2012-04-26. ^ a b c d e Christopher K. Leman; Preston L. Schiller; Kristin Pauly. "Re-Thinking HOV – High Occupancy Vehicle Facilities and the Public Interest". National Transportation Library. Retrieved 2012-04-30. Research funded partly by the Chesapeake Bay Foundation and the Bullitt Foundation, pp. 3–5. ^ a b c MIT "Real-Time" Rideshare Research (2009-01-24). "Selective History of Ridesharing – The 1970s Energy Crises". Massachusetts Institute of Technology. Retrieved 2012-04-30. ^ Peter Samuel (2005-01-12). "HOV lanes clogged with hybrids-complicate toll plan". Toll Roads News. Archived from the original on 2012-09-12. Retrieved 2012-04-25. ^ a b "High Occupancy Vehicle (HOV) Systems". Virginia Department of Transportation (VDOT). 4 December 2017. ^ Texas Transportation Institute (September 2002). "Executive Report. Effects of Changing HOV Lane occupancy requirements: El Monte Busway Case Study". Federal Highway Administration. Retrieved 2012-04-27. ^ "UDOT and UHP launch Express Lane education and enforcement blitz – Transportation Blog". blog.udot.utah.gov. Retrieved 2017-12-31. ^ Freeway Management Program, FHWA (2012-01-12). "Frequently Asked HOV Questions". Federal Highway Administration. Retrieved 2012-02-27. ^ a b Quinn DJ, Gilson DR, Dixon MT (1998). "Britain's first high occupancy vehicle lane – the A647, Leeds". ETC Proceedings. Retrieved 2012-04-27. ^ "Dutch parliamentary record on the carpooling lanes experiment (archived)" (in Dutch). Statengeneraaldigitaal.nl. Archived from the original on July 24, 2011. Retrieved 2012-04-25. ^ Institute for Transport Studies, University of Leeds. "Experience in Europe: Leeds, UK". Konsult Leeds. Archived from the original on 2012-02-22. Retrieved 2012-04-27. ^ European Conference of Ministers of Transport (2005). 16th International Symposium on Theory and Practice in Transport Economics: 50 Years of Transport Research – Experience Gained and Major Challenges ahead. OECD Publishing. p. 409. ISBN 978-92-821-0349-4. ^ T Haugen (2004). "Evaluation of Hov-lanes in Norway". ETC Proceedings. Retrieved 2012-04-27. ^ Organisation for Economic Co-operation and Development (2002). Road Travel Demand – Meeting the Challenge. OECD Publishing. p. 134. ISBN 978-92-64-17551-8. ^ "New lane to ease Hoddle Street blues - National - theage.com.au". www.theage.com.au. Retrieved 2018-06-11. ^ "Transit Guides". Auckland Transport. 2011-10-28. Archived from the original on 2011-11-25. Retrieved 2010-05-06. ^ a b Auckland Transport. "Priority lanes for carpooling" (PDF). Auckland Transport. Archived from the original (PDF) on 2013-02-09. Retrieved 2012-05-06. ^ "What is an EV lane". Retrieved 2017-09-27. ^ Auckland Transport. "North Shore transit lanes" (PDF). Auckland Transport. Archived from the original (PDF) on 2013-02-03. Retrieved 2012-05-06. ^ "CRASH ANALYSIS OF SELECTED HIGH-OCCUPANCY VEHICLE FACILITIES IN TEXAS: METHODOLOGY, FINDINGS, AND RECOMMENDATIONS". Texas Transportation Institute. September 2004. Dallas corridors with buffer-separated concurrent flow HOV lanes did show a change in crash occurrence with an increase in injury crash rate. The IH-35E North corridor experienced a 56 per cent increase in the injury crash rate. The IH-635 corridor experienced a 41 per cent increase in the injury crash rate. A closer look at the crash data indicates that the higher injury crash rates were primarily due to the crashes occurring on the HOV lane and on the inside general-purpose lane which is adjacent to the HOV lane. ^ Murakami, Kery (October 17, 2008). "Answers to BAT lane questions". Seattle Post-Intelligencer. Retrieved September 26, 2017. ^ Dawid, Irwin (26 February 2008). "Golden Gate Bridge for variable toll". Planetizen. ^ "About I-495 HOT Lanes". Archived from the original on 13 February 2010. Retrieved 31 August 2009. ^ Bob Hugman (2007-04-08). "Not Such a HOT Idea: 'Lexus Lanes' Could Ruin Virginia's Highly Successful HOV System". The Washington Post. Retrieved 2012-05-06. ^ "FAQs". 495-95 Express Lanes. ^ "Brookings Institution economic study on HOT Lanes". Archived from the original on 2008-08-28. ^ a b c "High Occupancy Vehicle (HOV) Lanes – Rules and FAQs". I'm pregnant. Do I count as one person or two? In the HOV world, you're one person. Babies of any age, however, count as a person. ^ "Carpool (HOV) Lanes". HybridCars.com. 2010-07-08. Archived from the original on 2012-02-28. Retrieved 2012-02-27. ^ "Eligible Vehicles – Single Occupant Carpool Lane Use Stickers". California Air Resources Board. 2012-04-12. Retrieved 2012-04-16. ^ a b "Fact Sheets on Highway Provisions". SAFETEA-LU. US Department of Transportation. ^ a b "High Occupancy Vehicle (HOV) Lanes". Ministry of Transportation. Government of Ontario. 18 October 2016. Retrieved 10 April 2018. ^ "AMA Statement On Motorcycles in HOV Lanes in NYC". Dealernews. Archived from the original on 2014-05-02. ^ "HOV Lanes". NYC DOT. The City of New York. ^ "Sluglines assists the driver by reaching the two or three person HOV requirement, and the passenger in getting a free ride to their destination". Sluglines.com. 2010-01-27. Retrieved 2010-06-01. ^ a b "Blow-up doll flunks Seattle HOV lane ploy". NewsChannel 8. 2011-05-05. Archived from the original on 2013-06-16. Retrieved 2012-07-30. ^ "Cyclops cam can distinguish between humans and blow-up dolls". Engadget. Retrieved 2010-06-01. ^ a b Mikkelson, Barbara (8 May 2014). "Diamond Lanes Aren't a Pregnant Girl's Best Friend". Snopes.com. ^ KOMO Staff (March 25, 2015). "Driver's 'most interesting' way to cheat the HOV lane fails". KOMONews.com. Retrieved June 16, 2015. ^ David Kravets. "Motorist Claims Corporation Papers Are Carpool Passengers". Wired. Retrieved 29 January 2013. ^ Driver Busted Using HOV Lane With Mannequin Passenger[dead link], WPIX Newsroom (PIX 11), February 3, 2010. (see also: Driver busted using HOV lane with 'dummy' passenger . ^ Driver Busted Using Carpool Lane With Mannequin[dead link], WPIX, February 4, 2010. ^ Frequently Asked Questions of the Highway Patrol Archived 2009-04-11 at the Wayback Machine. ^ Kerr, Joseph (2002-09-16). "Why transit lanes can slow you down". The Sydney Morning Herald. Retrieved 2006-11-08. ^ a b JOSIE GARTHWAITE (2012-02-24). "Access to the Car Pool Lane Can Be Yours, for a Price". The New York Times. Retrieved 2012-02-27. ^ Egan, Matt (3 March 2016). "NYC Restricts Manhattan Inbound Traffic to High-Occupancy Vehicles". Fox Business. ^ "HOV lanes could be History". The Baltimore Sun. 17 February 1997. ^ "HOV Lanes in California: Are They Achieving Their Goals?". Legislative Analyst's Office. Government of California. 7 January 2000. ^ Hausman, Sandy; Werman, Marco (8 September 2011). "Poor Indonesians Make Money in Jakarta's Traffic as Jockeys". The World. PRI. ^ "Pemberlakuan ganjil-genap pukul 16.00, kawasan Sudirman tersendat". August 30, 2016. ^ Tjahjadi, Victor (6 March 2006). "'Car jockeys' cash in on Jakarta's traffic snarl". Mail & Guardian. ^ Grata, Joe (2006-05-19). "New HOV gates start Monday on Parkway North". Post-gazette.com. Retrieved 2010-06-01. Wikimedia Commons has media related to High-occupancy vehicle lanes. California Eligible Vehicle List – Single occupant carpool lane stickers, California Air Resources Board. HOV lanes mapping based on data from OpenStreetMap.